Wooden toys are sturdy and durable, which makes them perfect for child's play. Making Wooden Toys is a great collection of classic wooden toys for kids that generations have enjoyed, including helicopters, planes, trains, circus animals, and acrobats. These timeless toys are playroom staples that inspire hours of creative play. Wooden Toys are great for kids of all ages and can spark imaginations. Build sturdy toys that will stand up to almost any amount of rough handling, and best of all, there are no batteries to replace. 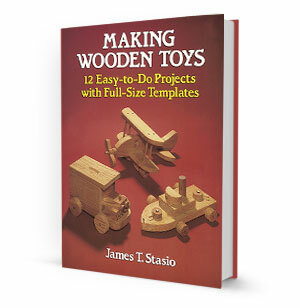 Written by veteran wood crafter and educator, James T. Stasio. 48 pages with full-size templates, diagrams, and photographs. Make charming wooden toys quickly and easily. The introduction provides handy tips on wood, finishing, and more. Large, easy-to-grasp, exploded view diagrams show how parts fit together. Each project lists materials needed. Handy, inexpensive guide to making 12 wooden toys of enduring appeal. Wooden toys unlock a child's imagination.